Earn up to 12,296 reward points. The YCR-2310III is an excellent introductory model that features a rounded leadpipe and ML (medium-large) bore for smooth and light response with a soft, warm tone. An adjustable third valve trigger accommodates different sized hands helping the player develop proper playing technique. 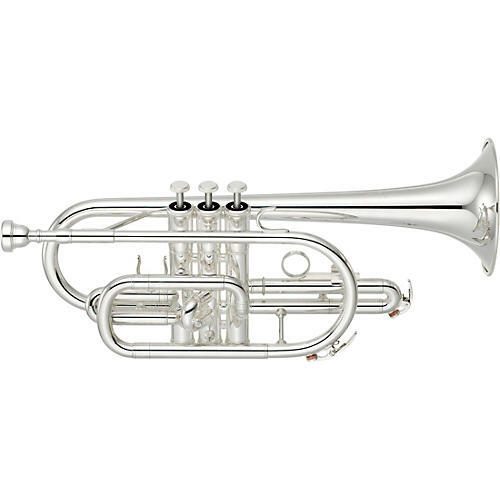 This design was introduced early in 2012 and represents the latest in manufacturing and design considerations within Yamaha's student brass line. 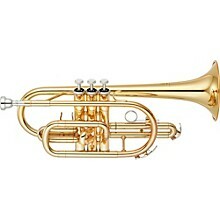 The newly redesigned, durable yet light two-piece bell is made of yellow brass for optimal playability and to promote good technique and endurance. Highly durable monel alloy pistons as well as newly designed valve buttons and bottom caps help lengthen the life of the instrument while also maximizing sound quality. The 2nd and main tuning slides are produced using the same method as high-end Yamaha models, which provides stability, a more refined tonal color and added durability. The redesigned rounded leadpipe and ML (medium-large) .459" bore give this instrument a smooth and light response and a warm tone quality.